SINGAPORE - Independent school fees will be further cut by more than half, in some cases, for children from low and middle-income families to increase diversity at Singapore's top schools. At Raffles Institution, which charges $335 a month for instance, children from households with a per capita income of between $691 and $1,000 will from next April pay the same $25 fee as at government schools. Those from families with a per capita income of $1,001 to $1,725 will pay $37.50. Children from the poorest families, with a per capita income of $690 and below, already have fees at independent schools fully subsidised, but will get a new $800 annual scholarship to help with out-of-pocket expenses such as equipment for projects or the cost of school trips. This Uplift scholarship will also be open to lower-income students admitted to independent schools after performing well in their Primary School Leaving Examination (PSLE) and are recipients of the Edusave Scholarship for Independent Schools, or who have qualified through the Direct School Admission scheme. The Uplift scholarship is also open to students at the School of the Arts and the Singapore Sports School. Education Minister Ong Ye Kung revealed on Thursday (Dec 27) how 7.5 per cent of students living in one- to three-room HDB flats scored in the top 20 per cent in the PSLE. "We should ensure that they can enter these schools if they want to," he said at a ceremony to appoint 66 new principals. Highlighting how Prime Minister Lee Hsien Loong spoke "very frankly" on this issue during the debate on President's Address to Parliament earlier this year, Mr Ong said: "Popular schools, such as certain independent schools, are attracting a greater proportion of students from families with higher socio-economic status. So diversity in these schools has gone down over the years. "This issue is not unique to us. We have seen this happening in many other developed societies with longer histories than us. Successful parents have more resources to invest in their children, they pass on their social capital, and send them to the popular schools, which become less open and diverse over time. We cannot blame parents for wanting the best for their children, but we need to work hard against this trend." 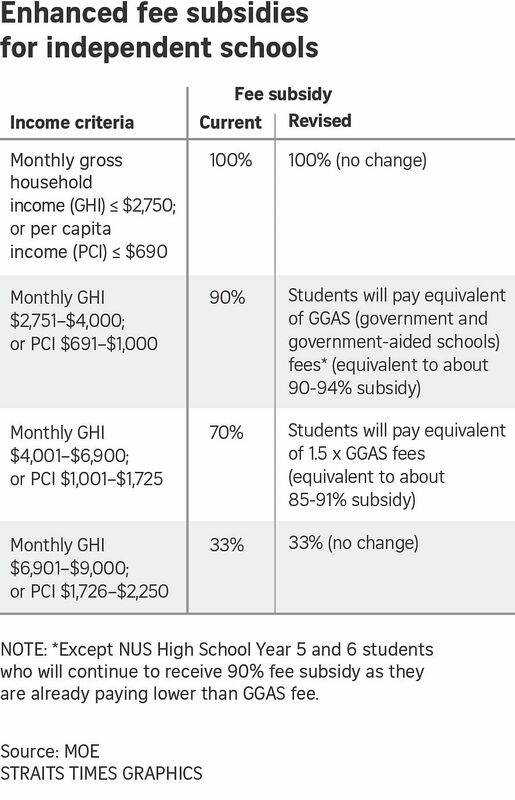 Under the new fee scheme, current and new students from low- or middle-income families will "pay a multiple of fees for government and government-aided schools, from zero to 1.5 times, depending on household income levels", said Mr Ong. Previously, the subsidy for students from these families was at 90 and 70 per cent of independent school fees. Children from households with a per capita income of between $691 and $1,000 had been paying $33.50 a month at RI, and those from the next income bracket, $100.50. There are eight independent schools - Anglo-Chinese School (Independent), Hwa Chong Institution, Methodist Girls' School, Nanyang Girls' High School, Raffles Girls' School, Raffles Institution, Singapore Chinese Girls' School and St Joseph's Institution; and two specialised independent schools - NUS High School and the School of Science and Technology. Mr Ong said that tackling inequality "remains an unfinished business of this Government", and that in this regard education plays a special role. "What better way to ensure social mobility than by preparing our children well for the future?" he said, noting the moves his ministry has already taken. For instance, from next year, secondary schools have to ensure that a fifth of places go to unaffiliated students. "We will review this floor over time," he said. "The school principals of independent schools are also making a stronger effort to widen their student catchment. They are reaching out to primary schools in the vicinity, to encourage eligible students to apply." "Through these additional financial assistance, all students, regardless of family income or background, can and should aspire to an education in a school of their choice, and need not worry about the cost of education. These are significant steps we are taking to enhance the diversity of independent schools, while preserving their meritorious culture."